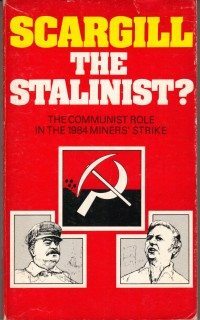 This controversial book exposed the Communist involvement in the British miners’ strike and its attempt to bring about a revolution. It touches on the theme of The Secret History of the West and The Libyan Revolution. Is our society seeing the start of a revolution which will affect every aspect of life – socially, politically and industrially – as some claim? This challenging and controversial book draws on a wide range of sources – many less well-known – in its examination of Scargill’s philosophy, and is a timely “warning to the British people”. The author, who is an experienced observer of Communism, shows how Scargill’s speeches reflect the revolutionary programme of the Communist Party of Great Britain, and how his approach to power reflects the practices of Stalinism. More than 150 of Scargill’s pronouncements are provided on topics such as Communism, Power, Class Warfare, Political Use of Industrial Action etc. The strong Communist involvement in the ’84 miners’ strike with support from Moscow, and Stalinism at work within the NUM are covered, and there is a helpful appendix. Your view on the struggle taking place in our society will never be the same again once you have read this explosive book. Nicholas Hagger presents a new approach to the British miners’ strike of 1984 by combining the eyewitness history and probing research into its leader’s sayings.